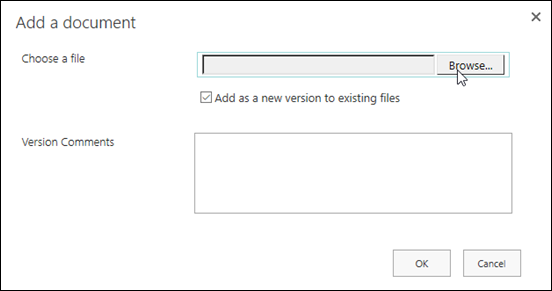 Once you've created a site in SharePoint Online or SharePoint Server, you can make changes to the settings, information, and permissions for the site. The descriptions here are based on SharePoint sites built using standard user interface components. If your site owner or designer has radically changed the look, you may not see the same thing presented here. For more information, see your SharePoint administrator. Group-connected team sites have different customization options. See Customizing SharePoint Online team sites for more information. 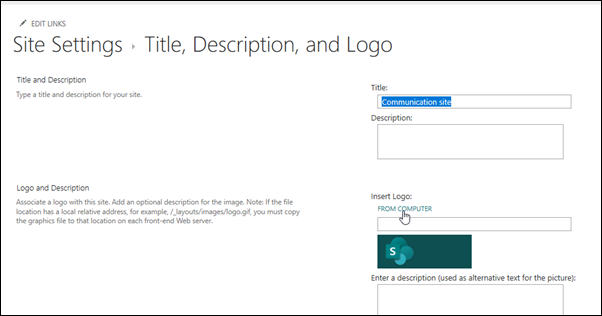 Here's how to change logo, title, and other settings for SharePoint Online team or communication sites. For SharePointOnline classic experience, or SharePoint Server 2016, 2013, and 2010, see the 2016, 2013, and 2010 tab. If the UI here doesn't match what you're seeing, see Troubleshoot settings. Important: To make changes to the logo, title, description, and other settings you must have owner or designer permissions on the SharePoint site. For more info, see managing site permissions. 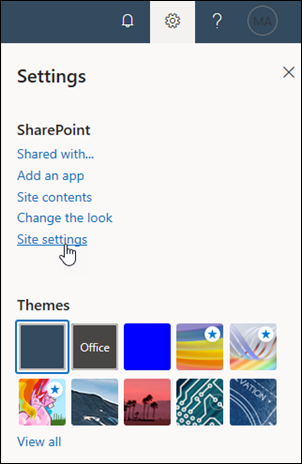 SharePoint Online team sites that are connected to an Office 365 group use the same logo as the Office 365 group to which they are connected. When you change the logo for your SharePoint group-connected team site, the logo for the corresponding Office 365 group will change also. The process for changing the logo for a SharePoint Online communication sites or a SharePoint Online team sites that's not connected to an Office 365 group is the same. In this case, only the site logo changes. 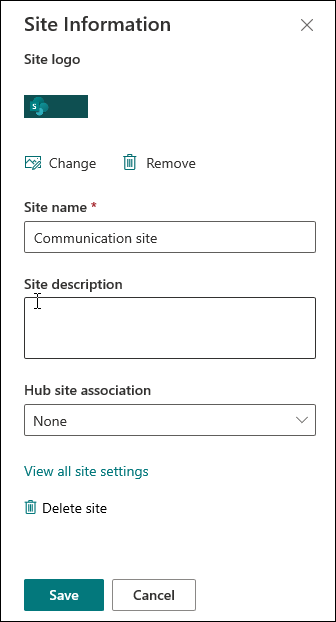 SharePoint Server 2019 team sites and communication sites don't have groups connected to them, but they use the same method to change the site logo. If your user interface doesn't match this one, you may be in SharePoint classic experience, or an earlier version. See the Server tab for steps to change settings. Important: To change the logo, title, description, and other settings you must have owner or designer permissions on the SharePoint site. For more info, see managing site permissions. Go to your SharePoint team or communication site. In the top right corner, click Settings and then click Site information. Under the site logo, click Change. Important: To change these settings you must have owner or designer permissions on the SharePoint site. For more info, see managing site permissions. These settings are only on a group-connected team site. 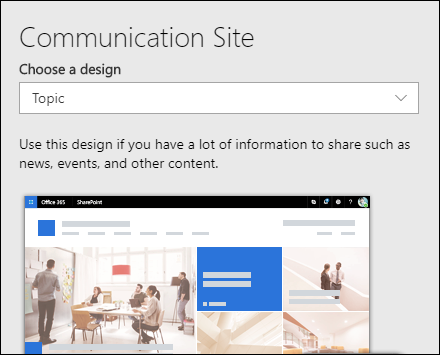 Go to your SharePoint team site. Privacy settings (optional): Public means everyone in your organization can see the content and become a member. Private means that membership requires approval by a site owner, and only members can view the content. This does not appear on a communication site. Team site classification (optional): Used to classify a site using values such as internal, confidential, high business impact, low business impact, etc. These values can pertain to sensitivity of information or to the life-cycle of information. They are determined and created by your administrator. For more information, see Manage site creation in SharePoint Online. This option may not be available on your site. These are the most common settings for sites. To change other settings and options for the site, click View all site settings. This brings up the classic SharePoint Site Settings page. Select a site design to apply a consistent set of actions or configurations such as setting a theme, adding links to the site navigation, or creating a list with a specific set of columns and settings to a site. In the top right corner, click Settings > Site designs. Select the design you want to apply and click Apply to site. Site permission levels are based on SharePoint permission groups. 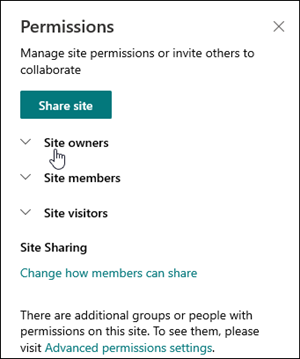 Members of a SharePoint permission group can either visit the site without editing it (Site visitors), edit the site (Site members), or have full control of the site (Site owners). Important: To change these settings you must have owner permissions on the SharePoint site. In the top right corner, click Settings . 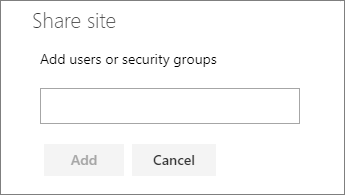 To give people access to your site, you can either add members to the Office 365 group associated with the site or you can share the site with others without adding them to an Office 365 group. For more on site permissions, see Understanding permission levels in SharePoint. Add Members to Group to add members to the Office 365 group associated with your site. This is the preferred method. Click Add members, enter a name or email address, and click Save. Members added to the Office 365 group are added to the SharePoint Site members permission group by default and can edit the site. They also have full access to the Office 365 group resources such as group conversations, calendar, etc. Share Site Only to share the site with others without adding them to the Office 365 group associated with the site. Enter a name or email address, click the down arrow to select the SharePoint permission level, and then click Add. Sharing the site gives users access to the site, but they won't have access to the Office 365 group resources such as group conversations, calendar, etc. 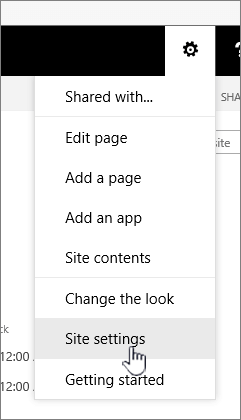 In SharePoint Server 2019, click Share site. In the Share site panel, enter the name of users or groups to share the site to. To change the permission level for an individual or group, click the down arrow next to the SharePoint permission level for that person or group and select Full Control to add them to the Site owners group, or Read to add them to the Site visitors group. Note: To view all members of the Office 365 group associated with your site and their SharePoint permission levels, click members at the top right corner of your site. In SharePoint Online, to remove someone who isn't a member of the Office 365 group associated with your site, click the down arrow next to the SharePoint permission level for that group and select Remove. Note: The Remove option is only available for individuals or groups that aren't part of the Office 365 group. To remove someone from the Office 365 group associated with your site, click members at the top right corner of the site, click the down arrow next to the permission level for that member, and click Remove from group. If you are a site owner, you will see a link for Advanced permission settings where you can configure additional SharePoint permission settings. For more information, see Understanding permission levels in SharePoint. SharePoint online service limit see SharePoint Online limits. Storage and user limits for Office 365 and SharePoint online see SharePoint Online Limits. To manage large amounts of data, see Manage large lists and libraries in SharePoint. The most common problem with trying to change settings is not having the correct permissions. If you aren't sure what your permissions are, check with your SharePoint, network, or Office 365 administrator. If you have permissions, be sure of the version of SharePoint you're using. For more info, see Which version of SharePoint am I using? If you've got a site that was built with an older version of SharePoint Online, it may be using the classic look. To change logo, description, or other settings, refer to the Server tab. SharePoint Online classic experience uses the same user interface for settings as SharePoint 2016. Here's how to change logo, title, and other settings on SharePoint Servers 2016 ,2013, or 2010. For SharePoint Online team or communication sites, see the Online tab. As owner, or user with full control permissions, you can change title, description, and logo for your SharePoint Server site.. In the top right corner, click Settings , or in top left, click Site Actions . Update the Title field. Add or edit the optional Description for the site. Click FROM COMPUTER, browse for an image and click Open. 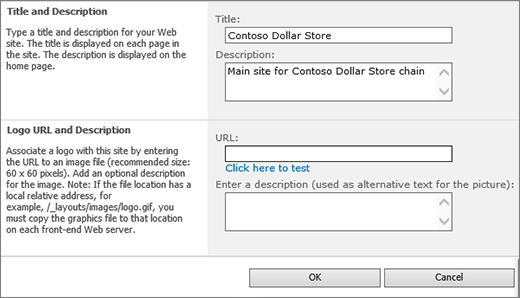 Click FROM SHAREPOINT, browse for an image on the SharePoint site, and click Insert. 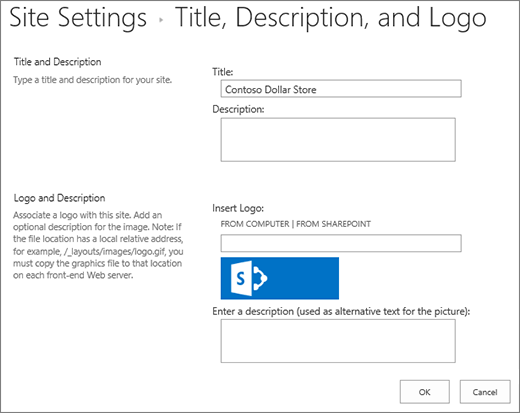 For SharePoint 2010, under Logo and Description, insert a URL to an image to use as logo. Site permission levels are based on SharePoint permission groups. Members of a permission group can either visit the site without editing it (Site visitors), edit the site (Site members), or have full control of the site (Site owners). To give people access to your site, you can either add members to a group associated with the site (preferred method) or you can share the site with others without adding them to a group. To invite people to your site, you invite people using the site Share button. For more info, see Share a site. To add people with a group, you can create a group, or use a pre-existing one and add members to that group. Groups provide varying levels of permissions that everyone in the group has, so it's easier to manage a number of users and what access they have. For more info, see Create and manage SharePoint groups. To change the permission level for an individual or group, click the down arrow next to the permission level for that person or group and select Full Control to add them to the Site owners group, or Read to add them to the Site visitors group. Note: To view all members of the Office 365 group associated with your site and their permission levels, click members at the top right corner of your site. Under Users and Permissions, click Site permissions. In Site permissions, click the group you want to remove a member from. Select the user you want to remove. Click Actions, and then click Remove Users from Group. For more information on how permissions work and the settings you can use, see Understanding permission levels in SharePoint.